The Maddy Team - Bringing Tradition Home in Christiansburg and The New River Valley. In Christiansburg, Virginia, tradition runs deep. From the classic homes and buildings to the lush forest that grow even grander with each passing generation, there is a warm sense of history that makes the area a truly special place to call home. And when it comes to buying or selling real estate in the historic communities of Montgomery County, The Maddy Team brings that same sense of tradition home for the people they serve. Billy and Pam Maddy are native of the area who pride themselves on running a business that reflects the small town values and charm of the New River Valley. With extremely personal service and an emphasis on honesty, integrity and good old-fashioned hard work, The Maddy Team has stood the test of time by creating winning results for their clients. The lush forests and mountains that envelop Christianburg and the New River Valley were not created overnight. These natural wonders have grown in stature to become one of the most prominent symbols of the area. They are symbols of endurance that add to the history and rural charm of this community. Like these natural landmarks, The Maddy's also started from humble beginnings. Billy Maddy has been an owner/broker, auctioneer, appraiser and a class "A" contractor. Billy was born and raised on a local Farm here in Christiansburg. At an early age, he learned the value of an honest days work. He discovered that a strong work ethic, integrity and dependability are not only fundamental keys to success, but timeless qualities that stand the test of time. Indeed, these very traits helped Billy grow up to become one of the premier real estate agents in the Christiansburg area. And today, these same principles are the guiding principles of The Maddy Team. After nearly 34 years working as a leading owner and broker in the town where he was raised, Billy was ready for a new challenge. 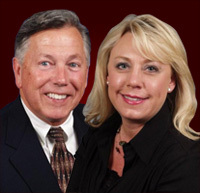 Bill and Pam decided to venture out and become affiliated with RE/MAX 8. The results of The Maddy Team, have the unique ability to tailor their services to the specific needs of their clients. With The Maddy Team, there is no bureaucracy or red tape to deal with. Instead, The Maddy Team offers people a friendly, professional way of doing business the old-fashioned way - with a handshake and a smile. The Maddy Team traditions and values of the community work one-on-one with their clients to make the entire real estate process a simple and enjoyable experience. We can provide our clients with the kind of personal service and attention that is so often lacking in real estate. In fact, Billy and Pam treat every single client as they would treat their own family. They understand that behind every transaction there is a family that is going to be affected. With this kind of caring and dedicated service, it's easy to see why The Maddy Team has stood the test of time in the New River Valley. From his days on the farm to his career in real estate, Billy has learned that teamwork is essential to success. That's why The Maddy Team can help create winning results for the people that put their trust in them. "Pam and I succeed together", says Billy with pride. As professionals we are dedicated to protecting your best interest." From their collective knowledge, insight and experience to their creative marketing and advertising of properties, buying and selling real estate has never been as easy or enjoyable for their clients. One of the greatest strengths is the combined experience of 49 years. Billy Maddy has been a leader in Montgomery County real estate for well over 34 years. Billy has personally handled every kind of transaction imaginable which makes him the ultimate resource for his clients. Billy has long track records of success in the local markets and are uniquely qualified to help people make the most of their real estate experience. When the time comes for your next home sale or purchase, put your trust in The Maddy Team. Billy and Pam Maddy are living proof that great things often start from humble beginnings! They both share a simple dream, to be recognized as trustworthy & reputable professionals! Pam prides her success from referrals and repeat clientele who want personal service that exceeds the ordinary! Copyright© Billy & Pam Maddy, All Rights Reserved. WELCOME: CHRISTIANSBURG, BLACKSBURG, AND RADFORD REAL ESTATE AND HOMES FOR SALE. About Christiansburg: Moving to Christiansburg located in Montgomery County, Virginia? About Blacksburg: Moving to Blacksburg located in Montgomery County, Virgina? About Radford: Moving to Radford located in Montgomery County, Virginia? About Montgomery County: Moving to Montgomery County located in Virginia? Floyd County: Moving to Floyd County located in Virginia? Pulaski County: Moving to Pulaski County located in Virginia? Latest Listings: Get The Maddy Team's latest Christiansburg, Blacksburg and Radord of Montgomery County listings of homes for sale first!